Nearly two years after my arrest, I am in high spirits as I return to the ranks of cultural workers and mass activists for national democracy. My incarceration brought me face to face with the grim conditions in prison, and the dismal state of our justice system. In those two years, as well, my comrades and supporters have kept me abreast on current events, national campaigns, and urgent people’s concerns. Our fight for human rights and justice amidst the climate of impunity in the country is even more pressing today; and it is a compelling reason for our unity and action. Our campaign for human rights has for the past years attained worldwide reach. 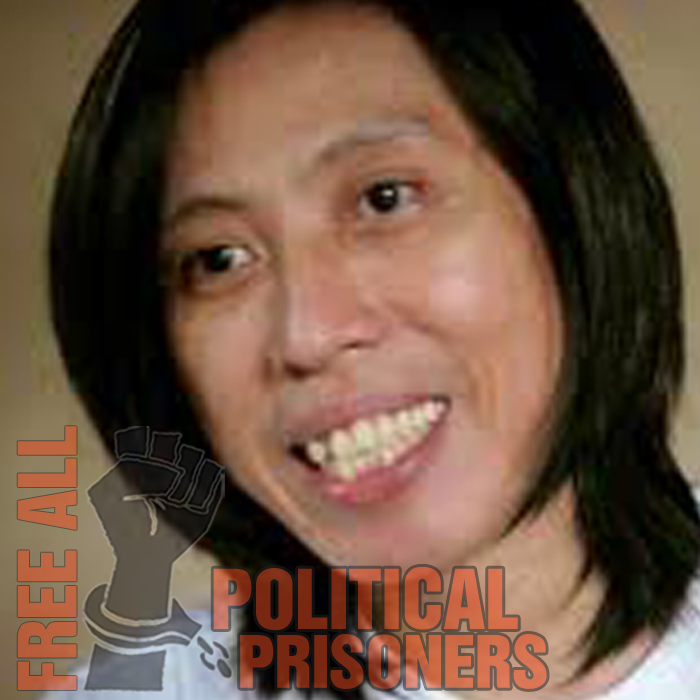 We are in a better position to push for the release of all political prisoners. Reflecting on my own experience, a crucial component of this campaign is our call to end the criminalization of political dissent, illegal arrest and torture. Only then can we ensure that people like Maricon Montajes, Charity Dino, Alan Jazmines, Bart Alcantara, Eduardo Sarmiento, Randy Vegas, Raul Camposano, who have chosen to serve the people will not suffer further injustice. I wish to thank the National Union of People’s Lawyers (NUPL) led by Atty. Edre Olalia, Atty. Jun Oliva and Atty. Rey Cortez and the Free Ericson Acosta Campaign (FEAC) which is a broad network that vigorously campaigned for my freedom here and abroad. I would also like to thank the Public Attorney’s Office led by Atty. Persida V. Rueda-Acosta, the doctors and staff of the National Kidney and Transplant Institute, Sen. Chiz Escudero, the International Committee of the Red Cross (ICRC), the National Commission for Culture and Arts (NCCA), KARAPATAN, SELDA, BAYAN, the Concerned Artists of the Philippines, the Amnesty International, PEN International and Philippine PEN led by National Artist Bienvenido Lumbera, the various Committee for Human Rights in the Philippines in various parts of the world, INTAL Belgium, HumanWrongs Philippines, the ALL U.P. Workers Alliance, CONTEND, various people’s organizations and progressive partylist groups representatives from Bayan Muna, Anakpawis, ACT and Kabataan, and the Kapunungan han Gudti nga Paraoma ha Weste han Samar-Kilusang Magbubukid ng Pilipinas (KAPAWA-KMP) which enabled me to integrate with the peasant communities in Samar. 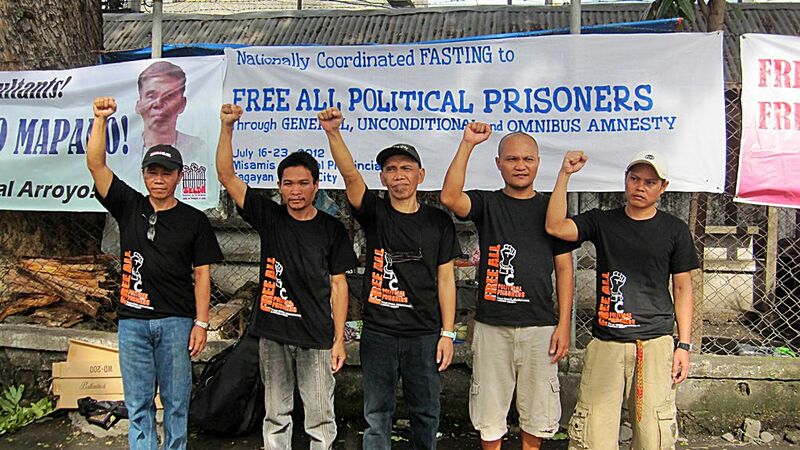 We will continue to call for a general, omnibus and unconditional amnesty for all political prisoners. We will continue to fight for justice. And through our collective efforts, we will be victorious. A day before Pres. Noynoy Aquino’s 3rd State of the Nation Address (SONA), Karapatan and SELDA today launched via http://www.youtube.com/watch?v=HnCjfcdJ-vY&feature=youtu.be a call out video for flash mob as part of the campaign to release all political prisoners. Following yesterday’s launch of the “Awit ng mga Detenidong Pulitikal,” by the Concerned Artists of the Philippines (CAP), members of Anakbayan in Sampaloc and San Juan danced to the song that describes the plight of political prisoners and calls for their immediate release. The groups encourage dancers from communities and schools, especially the youth, to use the song and dance steps for a nationally coordinated flash mob, details of which will soon be announced. Political prisoners in 10 prison facility all-over the country are on their 7th day of hunger strike and fast, in time for the SONA, to call on Aquino to heed the call for their immediate release, saying that they are only in jail because of fabricated criminal charges. There are 385 political detainees to date, 107 of them were arrested and detained under the Aquino government. Palabay added that protest performance art forms such as flash dances are being conducted by activists and cause-oriented artists in different parts of the world as tools to dramatize their social justice advocacies. “The life and struggles of the 385 political prisoners in the Philippines are a rich source of inspiration for creative expressions of protest and dissent,” she stated. MANILA, Philippines — Political prisoners across the country began a weeklong fast Monday to demand freedom ahead of President Benigno Aquino III’s State of the Nation Address on July 23. In Camp Crame, detainees Renante Gamara, Eduardo Serrano and Eduardo Sarmiento began fasting on Monday. Political prisoners from Southern Mindanao, Compostela Valley, Central Visayas, Eastern Visayas, Batangas, Isabela, New Bilibid Prison in Muntinlupa City and Camp Bagong Diwa in Taguig City as well as members of the group Samahan ng Ex-Detainees Laban sa Detensyon at Aresto, composed of relatives of friends of political prisoners, also joined the fasting. They called on Aquino to immediately grant a “general, unconditional and omnibus” amnesty to free all political prisoners in the country. On Tuesday, around 10 members from SELDA, Karapatan and Hustisya held a noise barrage outside Camp Crame to press their demand for freedom of the 105 political detainees arrested. Ipong cited the July 4 arrest of Agnes Mesina, a development worker with the Rural Missionaries of the Philippines in Cagayan. A former overseas Filipino workers, authorities have reportedly linked Mesina to the murder of Dutch development worker Willem Geertman, a charge her supporters have called ridiculous. Activist and human rights groups suspect security ofrces of being behind Geertman’s death. “Detaining critics of the government is nothing but a desperate act of the government to keep its perceived enemies silent,” Ipong said. Of the political prisoners, 13 are elderly, 48 are sick with various ailments and 20 have been detained for several years. There are also 13 consultants of the National Democratic Front of the Philippines, among them Sarmiento and Serrano. In a statement, the two, along with Gamara, accused policemen of depriving them of their rights after they exposed the alleged ill treatment of detainees by jail personnel and police. Another NDF consultant, Alan Jazmines, tagged by authorities as a member of the Communist Party of the Philippines’ Central Committee, has been transferred from Camp Crame to Camp Bagong Diwa on Taguig. A week before Pres. Noynoy Aquino’s State of the Nation Address (SONA), political prisoners from Luzon to Mindanao are conducting a one-week fast to push the call for the release of all political prisoners. “It has been two years since we started to campaign and lobby for the release of political prisoners who are in various jails, but President Noynoy Aquino not only ignored our call but also arrested and detained 107 more farmers, indigenous peoples, leaders of organizations and activists, as well as suspected rebels. As of June 30, 2012, there are now 385 political prisoners,” said Marie Hilao-Enriquez, chairperson of both Karapatan and SELDA. “This brutal campaign has resulted to 99 victims of extrajudicial executions, 10 victims of enforced disappearances, thousands displaced in communities classified by the military as rebel areas. All these happened during Noynoy’s two years, a picture no different from the GMA administration. It is no wonder that human rights violations, like the presence of political prisoners, continue to stalk our land,“ added Hilao-Enriquez. Karapatan also enjoins all civil libertarians and freedom-loving Filipinos to echo the call for the release of political prisoners. “There may be no declared martial law but the same repression against the people and impunity prevail. This must not be allowed to continue,” concluded Hilao-Enriquez. The pro-democracy policies of the Aquino government have become a total parody of the continuing declining state of the masses. Its obsession in its own “matuwid na daan” strategy is a mere hypocritical term to defraud people the real deteriorating state of the country, the dire need of the people to basic socio-political reforms and to cover the dissatisfaction of the Administration’s continuing plunging ratings of its performance of supposedly good governance. More importantly, Its indifference over the human rights situation, none different than his predecessor, Gloria Macapagal-Arroyo, has made him an exact opposite epitome of pro-democracy. Malacanang’s attitude towards political prisoners is demonstrated by its lack of interest over any political prisoners and boldly stating that there are no political prisoners in the country. Such statement is a blatant display of an iron fist without any regard for justice and peace. Such statement is an exact sentiment declared by the dictator Ferdinand Marcos during the martial law era. In strengthening the movement to free all political prisoners, SELDA (Samahanng Ex-Detainees Laban saDetensyon at Aresto) and KARAPATAN (Alliance for the Advancement of People’s Rights) – Northern Mindanao, are launching its campaign by demanding a General, Unconditional and Omibus Amnesty (GUOA) as the most expeditious way to release all who have been arbitrarily arrested and detained for exercising their right to pursue their political beliefs. As of March 31, 2012, there are 363 political prisoners (PPs) in various detention centers and prisons all over the Philippines, three of them are in the Misamis Oriental Jail. More recently, last July 12 (thurs), Alexander Yamson, a suspected NPA member, was nabbed at around 2:30pm by composite team of CIDG, PNP and intelligence unit on the basis of a warrant issued with trump up criminal charges against him, ironically not for political offenses. He is now languishing in jail. A series of nationally-coordinated activities will be launched, led by the political prisoners themselves and SELDA, to further make its mark to the people. The highlight of this campaign is the solidarity week-long fasting on July 16 – 23, 2012. The week-long solidarity fast will be held in different urban centers in the country by family, friends and human rights groups supported by different sectors calling for the release of the political prisoners. The ten (10) political prisoners in the Northern Mindanao Region are also joining the fast- 5 detained in Provincial Jail of Misamis Oriental, 2 in BJMP Malaybalay and 3 in BJMP Valencia. The Paaralang-Bayan, an education-cultural forum with the detainees will also be held in the Misamis Oriental Provincial Jail on July 16, 2012 from 2:00 PM to 5:00 pm. This will further impart knowledge of the present human rights situation of the country, the languishing conditions of the political prisoners and its quest for justice and freedom.